Harness the natural beauty of wood and gemstone beads. They can be combined to create a chic bohemian look that can be both casual and sophisticated. 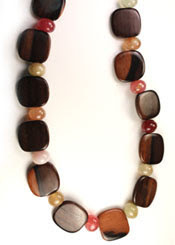 In my example, the rich, brown tiger ebony wooden beads are complimented by the multi-colored jade beads. To achieve a finer look with wooden beads, choose rich colors, smooth, polished beads and clean shapes.